Folks in middle Tennessee say that if a cold snap occurs when the dogwood blooms, we’ll experience a “dogwood winter,” but nothing has snapped here yet, and the beautiful white inflorescence of numerous dogwoods at Sewanee have been clustering a gracious plenty this last week of March. Typically, the trees bloom in mid-April, frequently as late as May, and a “dogwood winter” sometimes follows close behind the flowering. Thankfully, the weather during this dogwood blooming is perfect, with sun-filled days when the temps climb only to 70 degrees and slight winds breeze through the Cumberland Plateau. Following the advice of gardeners around Sewanee, we planted a small flower garden in the backyard because locals believe that it is safe to dig in the dirt after dogwoods blossom. However, another note of caution for early planters -- according to farmers and gardeners, a “blackberry winter” occurs when a cold snap coincides with the time blackberries are in bloom, which is typically during early to mid-May. So perhaps we’re not out of the woods regarding weather snaps yet. Hopefully, the weather and the white blanket of flowers will hold until Easter Sunday because many Christians regard the dogwood flowers as religious symbols of the season. Their white petals symbolize Christ’s white robe, and the red dots on their tips symbolize the blood of the Crucifixion. Also, the dogwood tree is reputed to have provided the wood for the cross on which Christ was crucified. At that time, dogwood trees grew tall; however, because of Christ’s death, the legend states that God stunted the dogwood species to prevent their future use as crosses for crucifixion. As a result, few dogwood trees today can be called “towering” (according to apocrypha that is). The wood from dogwood trees in this neck of the woods is often used for mountain dulcimers, cane, and for fine inlays, and is also utilized for wine or fruit presses. According to folklore, another former use for dogwood was as a tooth brush. Pioneers moving West would peel off bark, bite the twig, and scrub their teeth, according to Gunn’s Domestic Medicine. However, as a lover of old Western movies, I don’t have much to say about the not-so-good-looking teeth of the heroes portrayed on the big screen. In fact, some of them were toothless (excepting John Wayne, of course)! 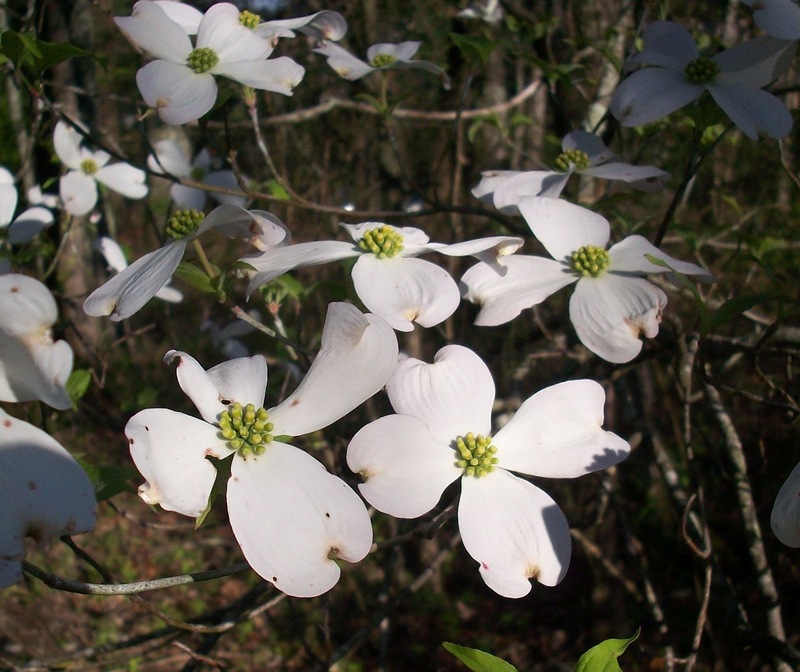 The dogwood tree has been adopted as the state flower of Virginia, as well as North Carolina and Sorth Carolina. When I was in my early thirties, my Godmother Dora, who lived in Blacksburg, Virginia, always wanted me to visit her in April when the Virginia woods were dense with dogwood blooms, but I missed the blooming every year. I often think of how she would have loved the Tennessee countryside in the Spring. Sunlight heightens the white blooms of the dogwoods that are at the edge of our small forest, and the trees grow well as understories in the semi-shade. I look at them and think of Oriental poets brushing into life their haiku poems about flowers and feel that early Easter blessings have already come to my province on The Mountain. After visiting the Smithsonian Exhibit, “The Way We Worked,” at Cowan, Tennessee Sunday afternoon, we walked up the main street of town, stopping often to peer in at closed shops. At the “Book Brake,” a bookstore owned by Tom McGee, two men beckoned for us to come in, and we entered the extremely long room that houses used and collectable books. Although we didn’t buy any books, we spent almost an hour talking with proprietor Tom McGee and Tom Wagner, editor of a publication “not affiliated with any group” entitled Cowan Comment. The latter is published six times a year, “one about every other month,” and provides interesting subjects to Cowan citizens and people who visit the community. Wagner’s mission is to encourage people to visit Cowan and to open businesses that will help revive life on Cumberland Street in Cowan. He asked me to contribute guest articles, so I plan to make more forays into the community to find fodder for blogs and informal essays. 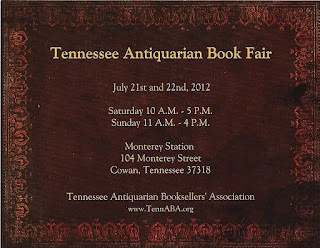 McGee gave us free tickets to the Tennessee Antiquarian Book Fair which is held in the Monterrey Station in Cowan each year. Cowan claims the distinction of being the only small town in America with a national book fair. 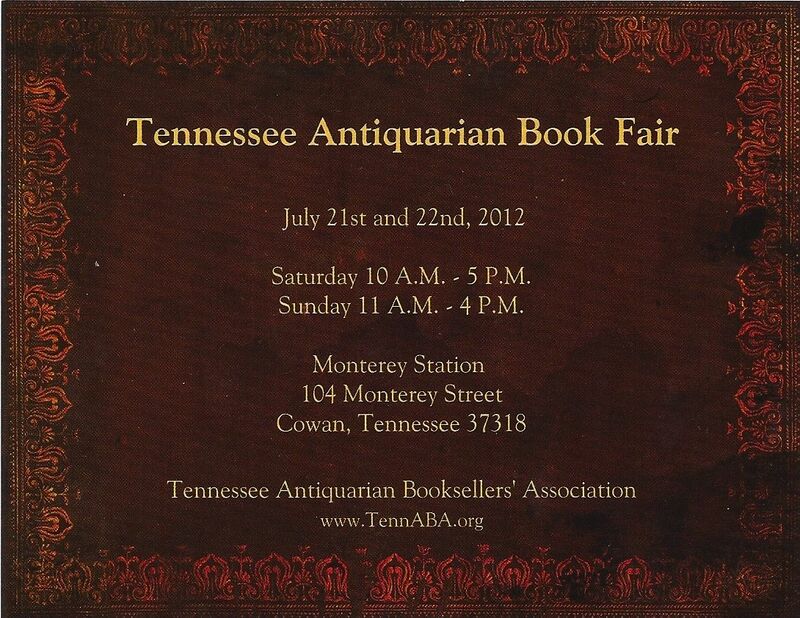 Most of the time these annual antiquarian book fairs are week-end events held in cities such as Boston, New York, Philadelphia, Seattle, Denver, and San Francisco. Last year, over fifty booksellers from more than twelve states participated in the Antiquarian Book Fair in Cowan, and more than a thousand book collectors and readers from throughout the North American continent attended the event. Lectures included Children’s Literacy, the Civil War in Tennessee, and “Book Collecting 101.” Nicholas Basbanes related tales from his book, A Gentle Madness, which included stories about book collectors from antiquity to the 1980’s. Cowan gained its fame as a railroad town, as mentioned in my last blog, but the first settlers were farmers in search of new land and a new life – Scots/Irish immigrants from Virginia, North Carolina, and South Carolina who came to the area during the 1800’s. 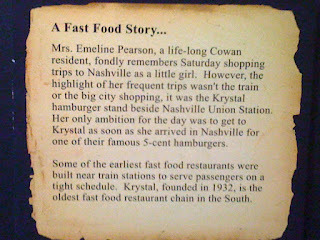 During the early 19th century, Cowan was a stage coach stop between Chattanooga and Nashville. Farmers sent their produce to markets by road to the Elk River at Estill Springs, Tennessee where it was shipped by river to ports on the Tennessee and Mississippi Rivers, notably the port at New Orleans. The town was named for Dr. J.B. Cowan, a medical officer on General Forrest’s staff during the Civil War, who is reputed to have given a large area of land to the town. Cowan became a rail center prior to the Civil War when rails were laid from Nashville through the Cumberland Tunnel two and one miles east of the town. Cowan residents have seen various industries come and go – the Sewanee Furnace which produced 70 tons of pig iron per day at its zenith; the Davis, Hicks and Greene Timber Company that built a railroad over the mountain into Alabama and shipped logs by locomotive; a pusher terminal where special engines helped heavy freights of 125 cars and passenger trains through a tunnel in the Cumberland Mountains so that the cars could start down the opposite side; and farming operations that produced corn and cotton. I obtained a bit of this information from an article by Dr. Andrew Rittenberry in an issue of the Franklin County Historical Review. He wrote “The City of Cowan has risen from the depths of the backwoods into a prosperous small town with industries and businesses. She possesses a great many hopes for the future: and a love and fondness of her past.” Cowan is a town whose time has come and is poised for revitalization. This Cumberland Valley town resembles many small towns in America that are gaining notice for their uniqueness and for their contributions to American culture and industry. 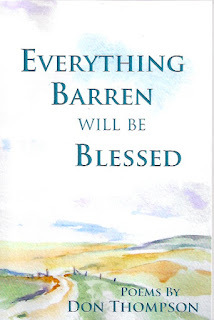 Pinyon Publishing is rapidly becoming “the poet’s press,” and its latest title, Everything Barren Will Be Blessed by Don Thompson, is a wonderful example of the fine poets featured in this small press’s list. I love Thompson’s collection – it’s a significant landmark on the landscape of poems about the West, from the abstract painting by Susan Elliott on the book’s cover to the rich poems that capture the Southern California desert and fertile valleys. I am particularly inured to this “poetry of place” because it features the area I wandered as a tourist every summer for twenty years. between the hills and the sky. You can trace it with your finger. in those jagged musings of freeze and thaw. have been pinned to the earth like memos. I read this volume of poetry last night at bedtime and didn’t turn out the light until I had finished reading the last wonderful poem. As the title indicates, poet Don Thompson has blessed the barren landscape of California desert and valley with this collection of accessible poetry about the San Joaquin Valley area. This is a book of poetry that will deepen readers’ perspectives and their sense of connection with nature. 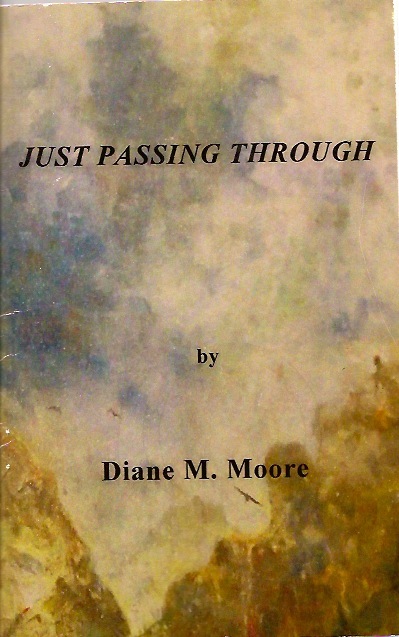 The poems are notable for “right” detail and metaphor, as well as memorable images that delight and nourish mind and spirit. 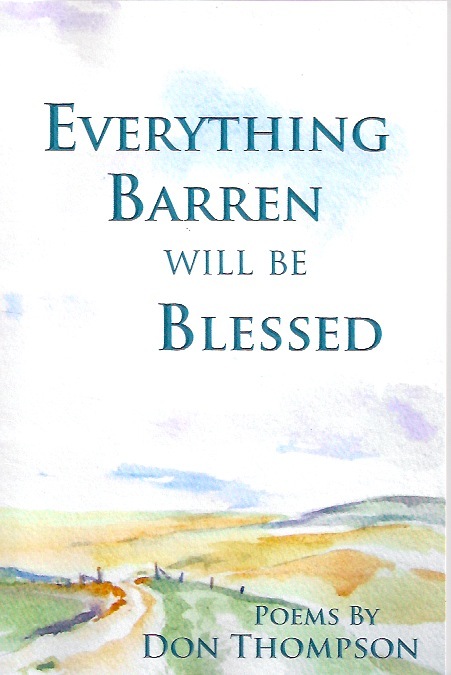 Everything Barren Will Be Blessed is the sequel to Thompson’s Back Road, a collection of poetry that captured the Sunken Garden Poetry Prize for 2008. This is an impressive voice published by an impressive press that has become a real match for 21st century small presses. Sunday afternoons on The Mountain here at Sewanee are desultory, particularly during the Spring break on the University of the South campus where we live in a modest cottage. The solution to ennui usually takes the form of a “field trip,” and yesterday we drove down the Mountain to the valley where the town of Cowan has been offering a unique Smithsonian exhibit entitled “The Way We Worked” at the Cowan Center for the Arts. 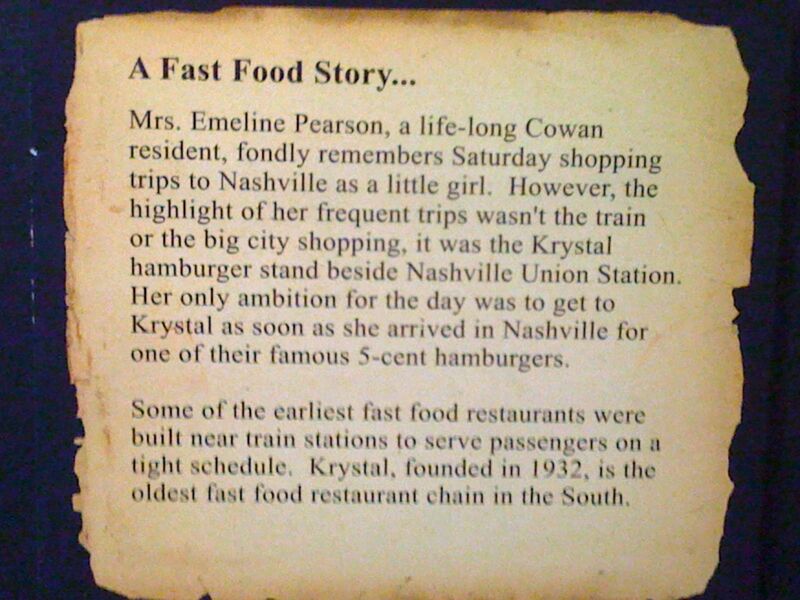 Cowan is a city with a population of 1737 people, and its claim to fame is as a railroad town, the site where the Nashville, Chattanooga and St. Louis Railway formerly employed 600 people from the area. 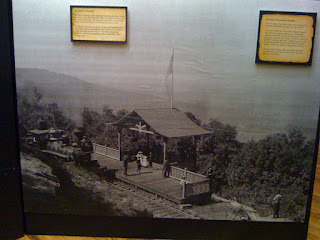 It was the last stop before a steep uphill climb onto the Cumberland Plateau, and pusher locomotive engines were required to help the trains make the ascent, a 2228 ft. grade which had to be mounted before reaching a tunnel which ran through the Cumberland Mountains two miles from the town. As a companion exhibit to the Smithsonian, the Cowan Railroad Museum offers a display showing railroad tools, methods of train travel, as well as photographs of Cowan’s largest employer between 1916 and 1928: the Davidson, Hicks, and Green Lumber Company which operated three sawmills and 25 miles of railroad. 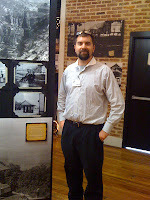 The coal and iron industries near Cowan are also featured in this exhibit. The Smithsonian Exhibit includes kiosks with photographic essays of The Way We Worked, Where We Worked, How We Worked, Who Works, and Why We Work, including an interesting study of “Women Against the Odds,” documenting the war effort of women at work during WWII. An interesting statistic from the 20th Century: 37 percent of the workforce in 1975 involved women, and 63% were involved by the year 2000. In addition to the Smithsonian Exhibit and the Cowan Railroad Museum Companion Exhibit, an Arnold Air Force Base Display, Falls Mill Display, University of the South Display comprise exhibits in the Cowan Center for the Arts Theater. 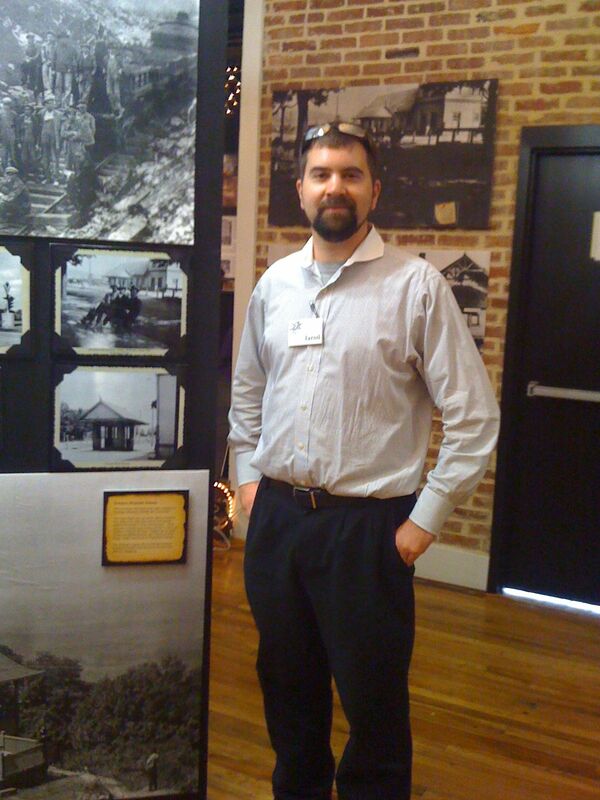 Next door in the Training Center, displays from the Crow Creek Heritage Preservation Society show how people of the Crow Creek Valley made a living as miners, railroad workers, farmers, brick makers, and as workers in the logging and tanbark industry. Photographs from The Grundy County Historical Society Heritage Center are featured, the latter showing photographs of the Swiss Colony at Gruetli, the Sam Werner Lumber Company, and a display about Dr. Lilian W. Johnson, Advocate for Agricultural Cooperatives. Franklin County Historical Society and Kokomo Grain Company also carried out the theme of how workers form the backbone of Franklin County. I know the work ethic is strong in Franklin County as we have had carpenters, plumbers, electricians, and housekeepers working on the cottage during the past four years, and while they have been sometimes sporadic about showing up to do the work, when they appear, they crawl under the cottage, climb on the roof, remove windows for cleaning, working in teams of four or five, sometimes in blazing August temperatures that would fell a Louisianan. No, I didn’t ask for the story, but such accounts are characteristic of the workers around these parts, and I applaud them for their work ethic. “The Way We Worked” display at Cowan illustrates the strength and endurance of workers in middle Tennessee who have kept our society and economy running despite downturns, politicians who make false promises, bank crashes, inflation, and wars. “The Way We Worked” exhibit, offered in partnership with Humanities Tennessee, Museums on Main Street, the Smithsonian Institution, Cowan Railroad Museum, and State Humanities Councils nationwide, will be open until April 21. Lectures will be offered Sundays and Thursdays every week until April 19. The exhibits are free, but donations help support ongoing work of these organizations. I’ve placed photographs of my brother Paul’s yard on my blogs in the past – scenes of his beautiful garden, benches, and lattices he has built to create a lush California scene that deserves to decorate a postcard. 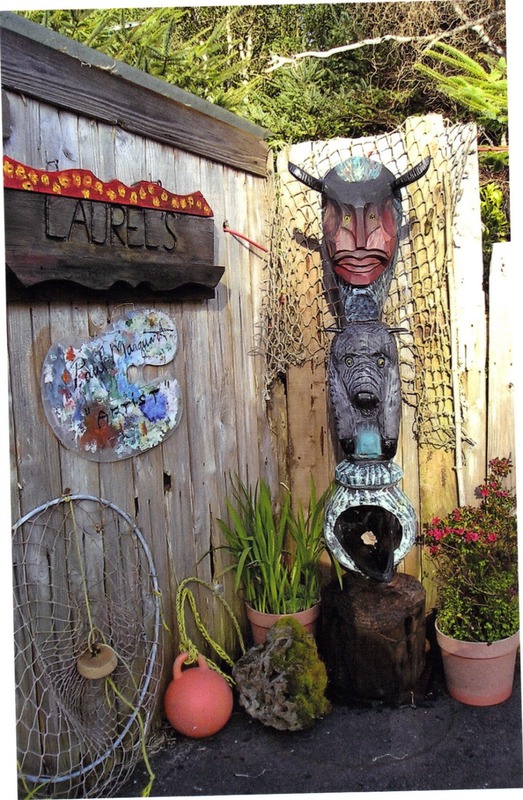 Yesterday, his wife, Lori, sent me a photograph of the latest addition to his yard that she and Paul saw and bought on a walk through the neighborhood in northern California – a totem pole. I’ve included the photograph of it but have no idea what this particular totem symbolizes. I do know that totem poles are often representative of kinship groups and aren’t objects of worship. In the particular coastal area where Paul lives, totem poles are more common than in southern California and are the products of local descendants of aborigines. The carving culture has actually moved down from British Columbia and Washington to this area along the northern coast. Although the totem poles once represented clan lineage and legends, today, they are mostly artistic representations. Some of them have been used in aboriginal cultures to represent shamanic powers, but I don’t think Paul’s carving belongs in that category. During the 18th century, Christian missionaries denounced totem poles as objects of heathen worship and tried to destroy them. In some places, notably in Canada and the Southwest, totem poles have been labeled as “junk art,” a naming that demeans native cultures and the skillful carvers within those cultures. Martin makes this choice of a hawk for his totem because he’s told by a shaman that every young man needs a dream animal to protect him. In actuality, many carvers of animal totems that decorate poles feel that the bears, birds, and other animals represent protection for the carvers. I’ve written Paul's wife, asking her to identify the carvings on the new totem pole and to tell me what they symbolize. I hope that his new object of yard art isn't one of the totems that shows symbols of quarrels and murders about which Native Americans prefer to keep silent --the topmost figure is rather ominous-looking! When the Spanish arrived in the area that is now known as New Iberia in 1779, they named their post Nueva Iberia, in honor of the “land of flowers,” a phrase describing their native Iberian peninsula. I don’t know the types of flowers and plants that enchanted them on their arrival during the 18th century, but today, the azalea, a flowering shrub with its lavender, red, white, orange, and pink blossoms, abounds in most yards and gardens of the city each Spring. New Iberia has its own Azalea Trail with designated paths of the colorful plant and joins with other southern cities in North Carolina, Georgia, Florida, and South Carolina in honoring the flower by organizing azalea festivals. 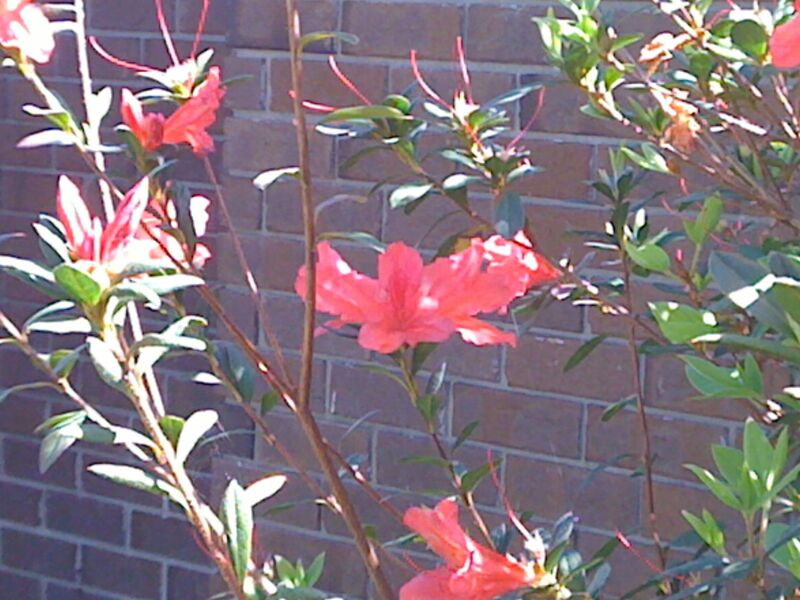 The azalea is also one of the symbols of Sao Paulo, Brazil. I remember arriving in New Iberia in January, 1964, and to my dismay, rain fell steadily almost the entire month. I looked out at the gray sheets of rain as I drove over the old bridge arching above the muddy Bayou Teche and wondered if I’d ever like living in the area. 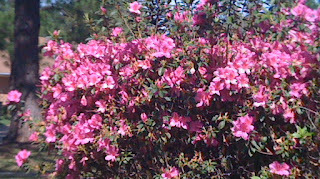 However, by late February, the city had begun to come alive with azaleas. 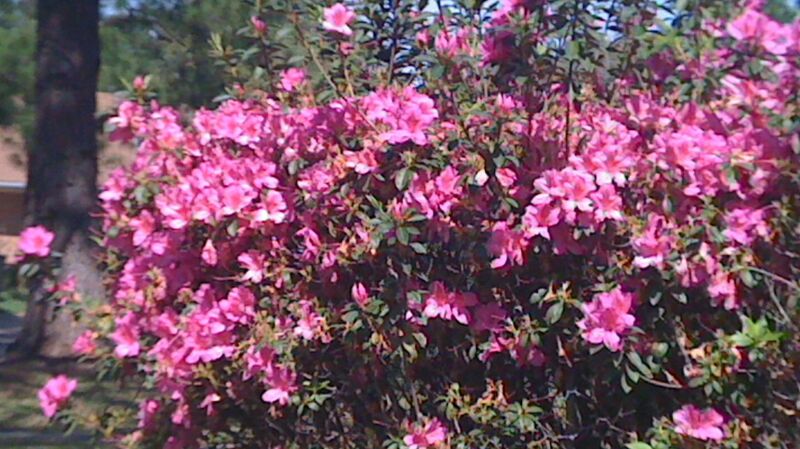 The sight of these bushes with their vari-colored blossoms inured me to the Queen City of the Teche, and every year I marvel at the few azalea bushes blooming in my yard, wondering how they have thrived without fertilizer of any kind or expert pruning. The photographs in this blog are of azaleas in my yard that have been blooming for three weeks now. I love Shakespeare’s description of Cleopatra: “Age cannot wither nor custom stale her infinite variety.” About nine years ago when I was 68, a good friend gave me a book of photography entitled Wise Women by Joyce Tenneson, inscribed with the words “For a wise, spunky and lovely woman,” and I treasure both the book’s contents and the inscription. Wise Women is a book that underlines the vitality, courage, and grace of women who are still practicing their vocations – poets, activists, dancers, musicians, grandmothers in photographs that reveal what it means to grow in strength and grace as they get older. Tenneson’s work accomplishes what she hoped in producing this book – it helps dispel the negative attitude that advancing age is a time of degeneration, physically and mentally. She photographed the faces of women in their last four decades of life who remain dedicated to bringing a sense of beauty and connectedness to other women, portraying many women whom the aging process has actually enhanced. 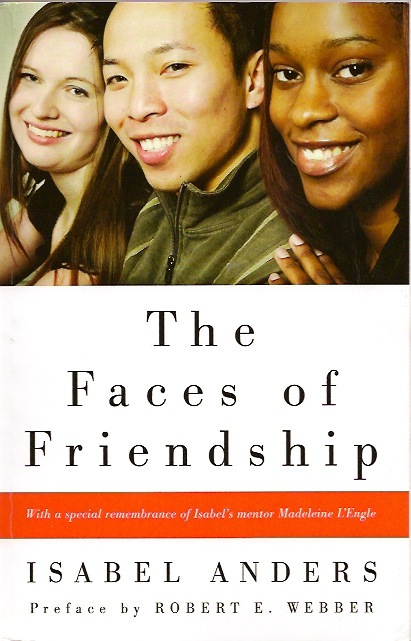 The book is filled with wonderful pictures of role models for older women… and for younger ones who fear aging and try their best to claim the Fountain of Youth through cosmetics, aping youthful styles in dress, focusing obsessively on fitness, crash diets, even becoming anorexic to achieve perceived youthfulness. embracing the grace of diffraction. The painting on the cover of Just Passing Through was rendered by my brother Paul.